Time was, when to get into art school, nothing was required other than a collection of drawings that demonstrated to the educated eyes of the art school’s teachers clear talent in the visual art fields. It is impossible to explain to those who cannot see it for themselves why this was such a good and sensible means of selection. It so happens that at the moment there is an exhibition – “Drawn Together” – of works in a variety of graphic and pictorial media produced by a body of people who love to draw and who see drawing itself as a sufficient vehicle for artistic realisations. 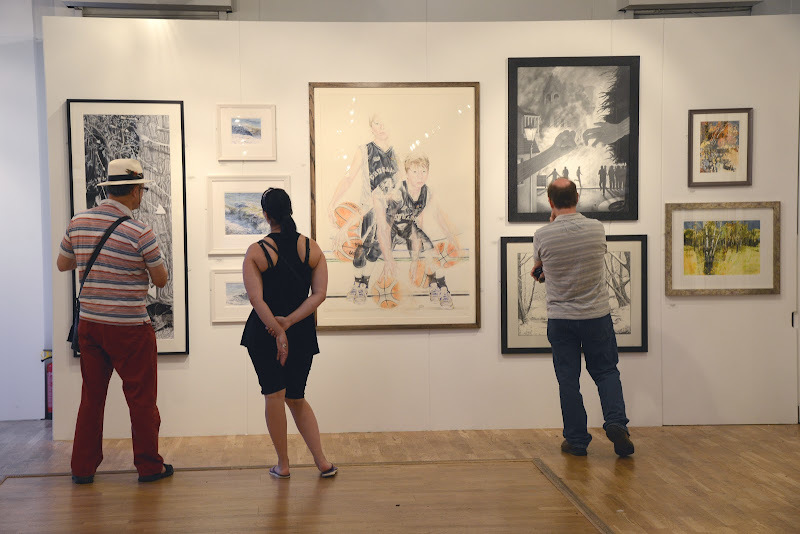 These artists are all members of the Society of Graphic Fine Art and their works are on display, free of charge, until Sunday, July 5, at the Bankside Gallery on the South Bank, hard by Tate Modern (for full details, see below, bottom). Many visitors to the Bankside Gallery, having wandered in after a visit to the Tate’s adjacent cavern of Official State Art Emptiness, express delight and surprise at the richness, variety and manifestly engaged – and therefore engaging – quality of the art on display. The society was founded in 1919 and aims expressly today, as then, to promote fine drawing skills. When I took over as President in February 2014, I felt the time was right for the SGFA to be launched into the heart of London, and where better than at Bankside Gallery, within a nib’s width of Tate Modern. Effectively, I wanted to put drawing in its rightful place – firmly on the map in the creative heart of the capital and on the doorstep of Tate Modern, the home of Abstract and Conceptual Art. Proudly displaying our very distinctive LOGO on the Bankside Gallery facade, I walked in, and although I had been present at the handing-in and hanging of the show the day before, on passing through the main entrance just before the exhibition officially opened to the public, I was transported into another world – a world of contemporary creativity and exquisite craftsmanship. I was just left standing by the impression of a wonderfully diverse, strong and at the same time uncompromising display of newly created work by Members of the Society. Our in-house exhibition designer and member, Stuart Stanley, has created a visual journey by cleverly juxtaposing traditional with modern, colour with monochrome, strength with delicacy, captivating the spectator. Bob Ballard sketches from life directly onto etching plates, and for this show has produced coloured etchings as though ‘in conversation’ with his sitters. It seems almost impossible not to be pulled into the mysterious lives beyond the powerfully drawn lines. I am drawn back to them, each time feeling I am getting to know his people, and one forgets they are just lines on a flat surface! David Brooke has a very distinctive style, and for this exhibition he has produced highly resolved coloured pencil drawings which can be visited and re-visited and yet always be discovering something new. 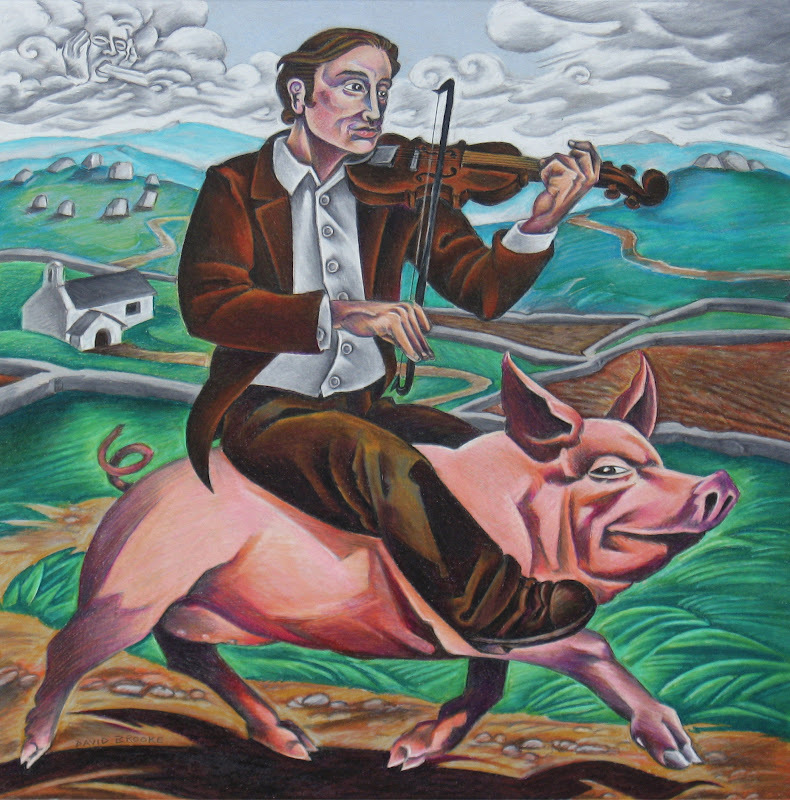 David Brooke, Fiddler on a Pig, Coloured Pencil Drawing. Size, including frame: 17 X 17 inches (43 X 43 cms). 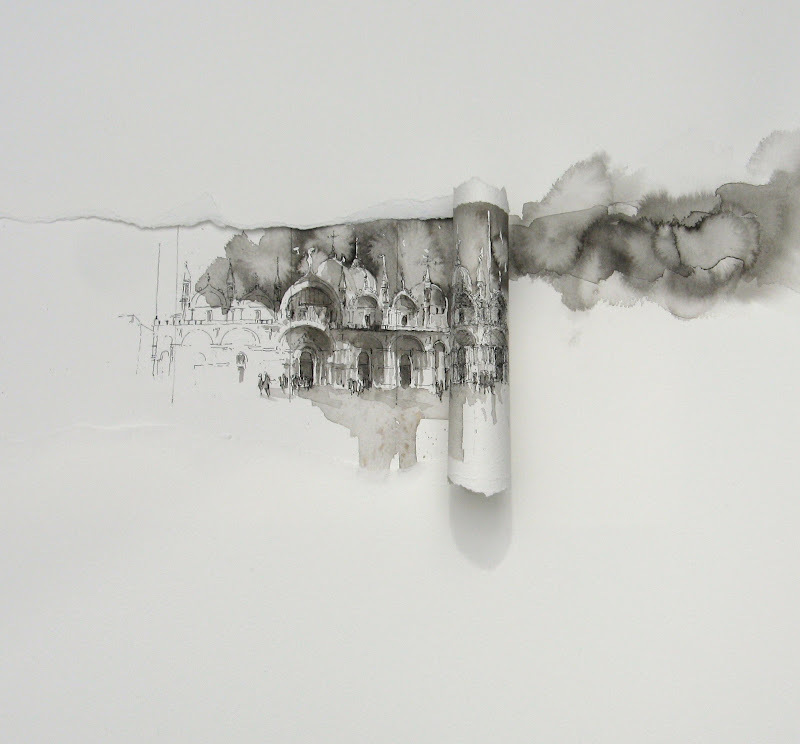 My own works (Jackie Devereux) – Venice under re-construction and Windswept, are part of an adventure I am having with ink line & wash, creating 3D works on cut and torn paper – some of these works occasionally break out of their frames – like me, not wanting to be restrained by convention. Above (top): Jackie Devereux, Venice under Re-construction, b & w, 52 cms square. Above: Jackie Devereux, Windswept, 52 cms square. 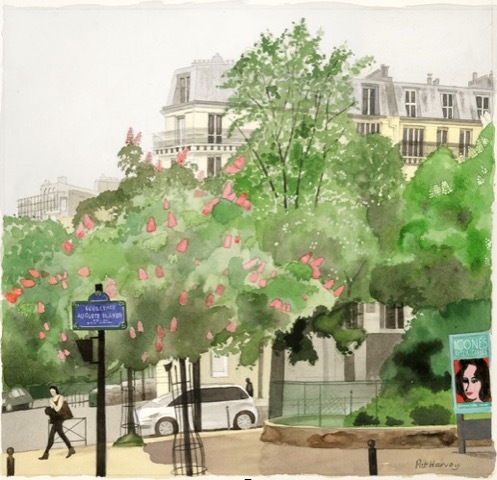 Pat Harvey has had a lifetime love affair with Paris – indeed France in general – and will sketch there whenever possible, and recently has produced a new series of works in watercolour which transcend merely recording a scene, but which embrace ‘la vie en france’. Having lived there myself for many years, I am transported back through her images and her mature use of colour and tone. 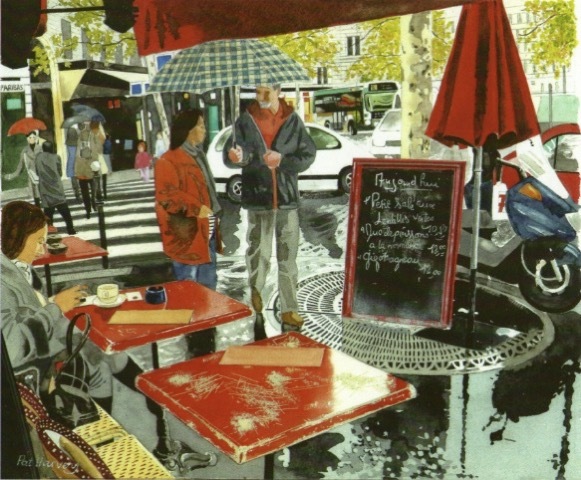 Above (top): Pat Harvey, Ca, c’est Paris! Above: Pat Harvey, Cafe ‘Le Royal Pereire’, Paris. Vincent Matthews’ works always transmit his feeling for quiet, wide open spaces, and these masterly minimalist aquatints with breathtaking compositions say it all with very little – Vincent is completely at one with his environment. Above (top): Vincent Matthews, Dungeness Chimney, 49.5 x 53.5 cms. Above: Vincent Matthews, River Rother – Rye, 49.5 x 53.5 cms. Myrtle Pizzey and her incredible linocuts speak with every line. Her work is sometimes far taller than herself, and the technical prowess to achieve such beautifully crafted hand pulled prints is nothing short of amazing. Above: Myrtle Pizzey, Jim’s Rhyne 97 x 77 cms. See also, above (below the SGFA logo): Myrtle Pizzey, Willows by the Sheppey, 77 x 97 cms. 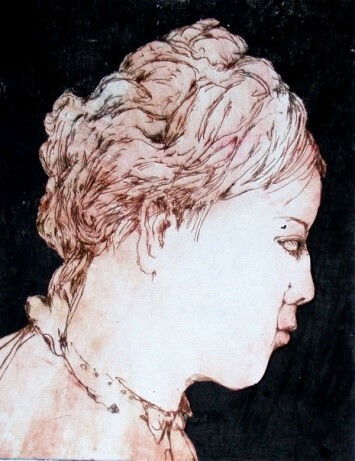 Susan Poole, through her passion for sketching wherever she travels, creates etchings and wood block prints from these sketches with a great deal of skill and feeling. Her Black Rhino woodcut comes alive in a way that could so easily be lost without the studied understanding of her subjects – gained only through looking and recording in great depth. 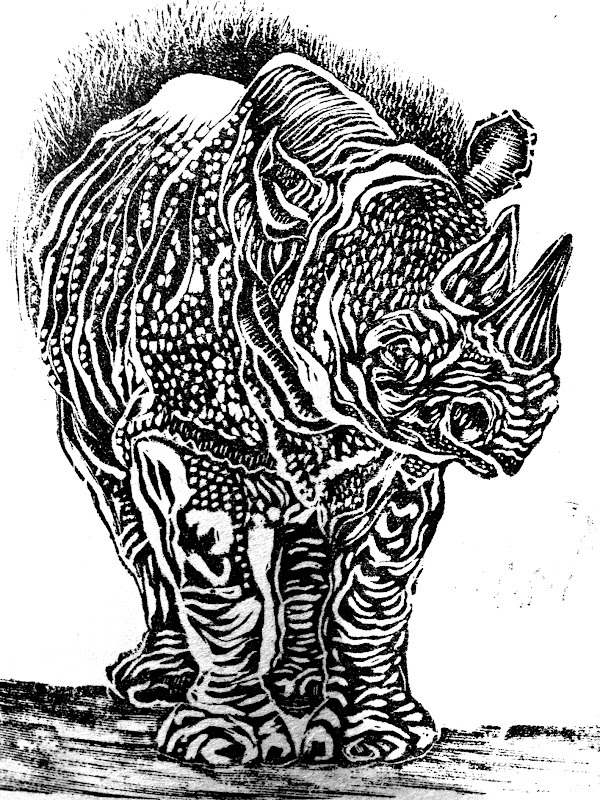 Above: SusanPoole, Black Rhino, wood engraving. 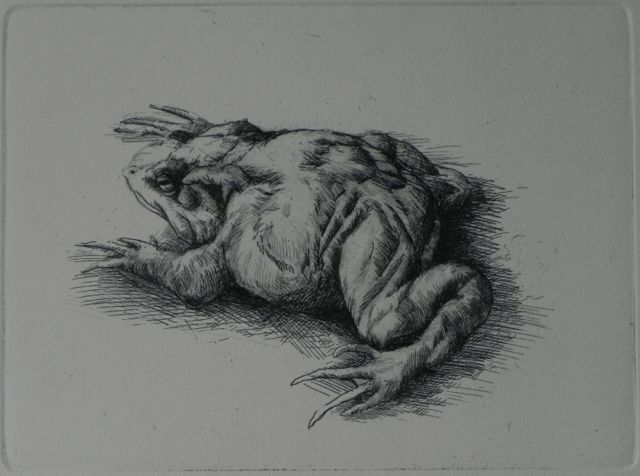 Clive Riggs and his amazing mezzotint Toad – I can almost feel the flesh! 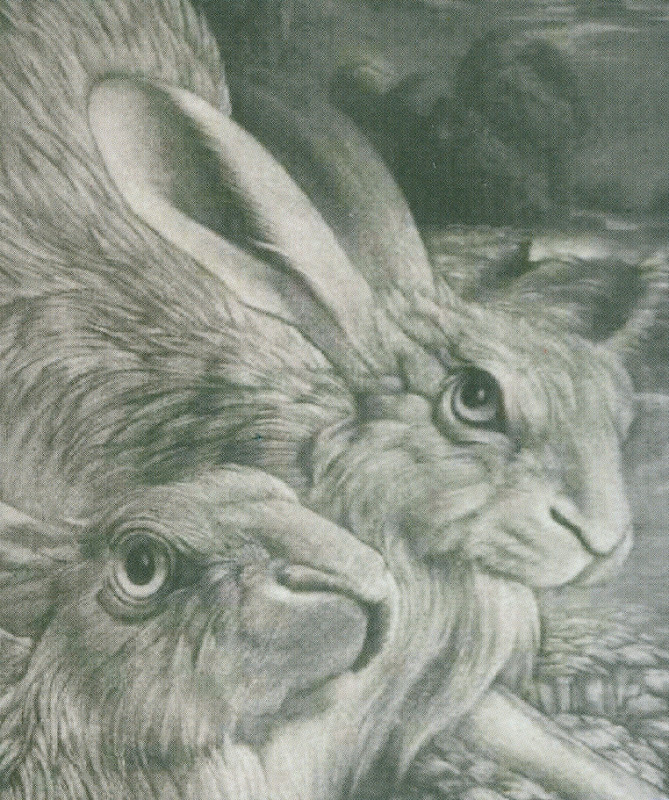 Clive’s study of two hares ‘Offspring’ was chosen for the image on the invitation for this exhibition and his work always displays amazing skill not only in portraying the chosen subjects, but in his use of this classic but rarely seen engraving technique. Above: Clive Riggs, Toad, 33 x 37 cms. See also, above (below Myrtle Pizzey’s, Willows by the Sheppey), Offspring – a detail of a pair of hares, up to no good, perhaps, in the moonlight, by Clive Riggs. Annie Ridd always portrays her subject matter blending strength with delicacy usually life size, and I am always drawn in to find what I know is there and yet cannot immediately see! I never want to find insects in my own undies, but in Annie’s unique works they are exquisitely portrayed. 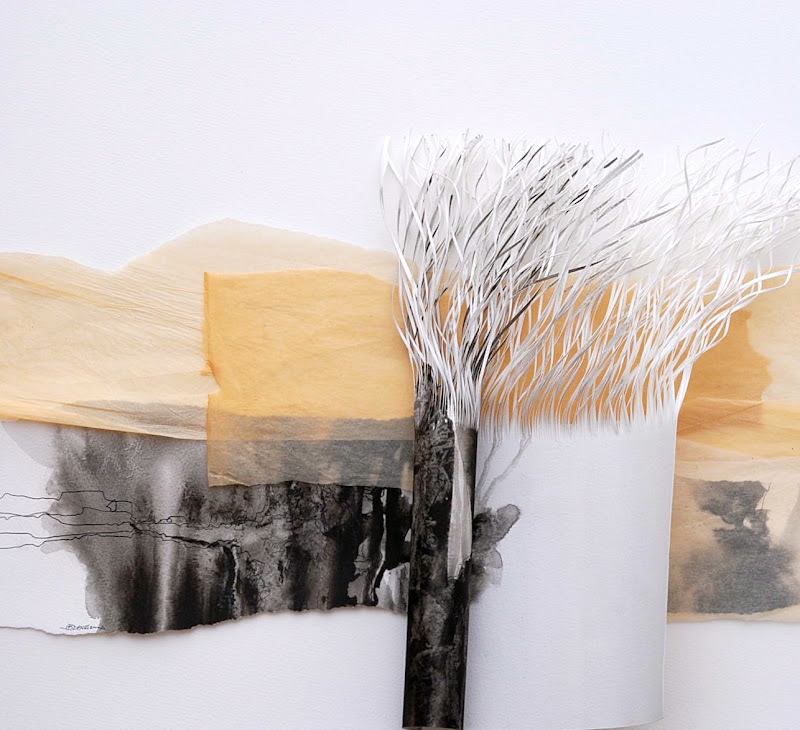 Above: A drawing by Annie Ridd. 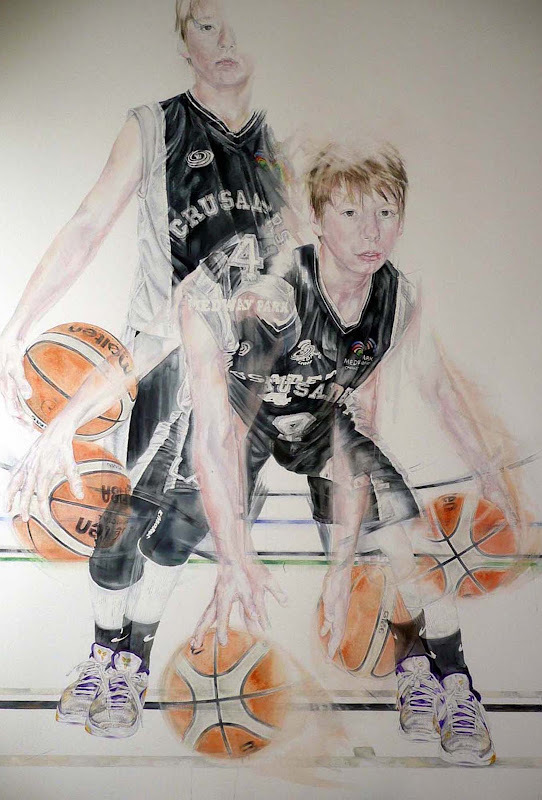 Claire Sparkes and her ‘Point Guard’ graphite and watercolour larger than life drawing demands multiple visits to take in the depth of thought and work that has gone into its creation. ‘Chapeau’ Claire, you’ve done it again! 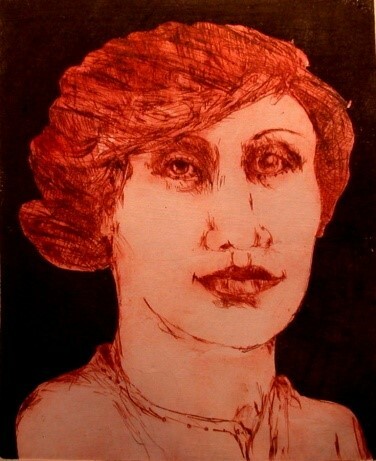 Above: Claire Sparkes, Adams Point Guard, 164 x 111 cms. 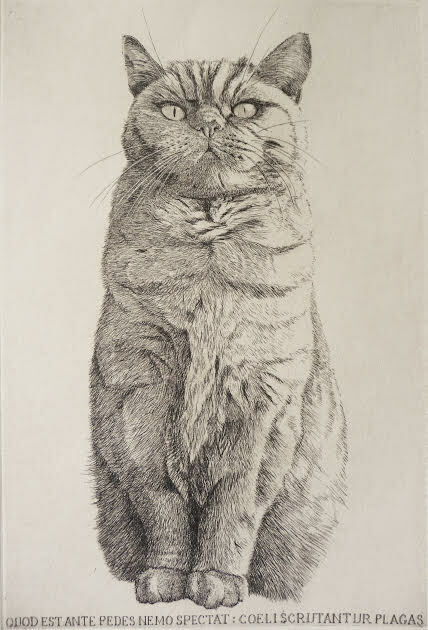 Will Taylor has produced as always, some beautiful etchings, but it is ‘Spectat’ the amazing cat with the ‘big stare’ that I can’t take my eyes off! Perched dead centre on the plate – the uncompromising attitude and composition is fabulous. Above: Will Taylor, Nemo Spectat, 59 x 48 cms. Evident throughout this entire exhibition – as, in fact, in all exhibitions the SGFA puts on, is the passion for drawing – drawing with anything, drawing on anything, drawing made anywhere and any time, and, drawing that demonstrates that the strength and power of the work we as a Society create is uncompromised by market forces, and is unstinting on quality and application. We move with the times and yet uphold traditional values. As we head towards our Centenary in 2019, we continue to challenge ourselves, our own ideas, and perhaps, the productions of the others. Below: The SGFA show Drawn Together at the Bankside Gallery, 48 Hopton Street, London, SE1 9JH, 020 7928 7531. This entry was posted on July 2, 2015. It was filed under news and was tagged with "Drawn Together" exhibition, Annie Ridd, Bob Ballard, Claire Sparks, Clive Riggs, David Brooke, Jackie Devereux, Myrtle Pizzey, Pat Harvey, Society of Graphic Fine Art, Stuart Stanley, Susan Poole, Tate Modern, The Bankside Gallery, Vincent Matthews, Will Taylor.